Ms. Carmen Julia Rios daughter of Gregoria Torres and Nemecio Rios was born February 18, 1929 in Ponce, Puerto Rico. 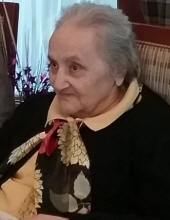 She entered into rest on March 16, 2019, in the presence of her loving caregivers at Citizens Nursing Home in Havre De Grace Maryland. Ms. Rios, a resident of Bronx, New York worked many years in a factory before she retired. She became a faithful member of her Christian church until her departure. She was a devoted homemaker who dedicated her life to serving God, caring for her family, friends, and neighbors. She leaves to cherish her memories: three sons, Robert Pena (Ana), Julio Guzman, Carlos Barrios; two daughters Rita Pena, Yvette Torres (Ivy Martin); two sisters Monin Rios, Naomi Rodriguez (Samuel) and seven grandchildren; April Cruz, Taina Barrios, Carlos Barrios, Roberto Pena (Awilda), Ray Pena (Lisbeth), Ruben Pena, Rafael Pena; 16 great grandchildren, great, great grandchildren, and a host of nieces, nephews, and other relatives and friends. A visitation will be held on Sunday, March 24 from 2-4pm and 6-8pm at the Tarring-Cargo Funeral Home where a funeral service will be held on Monday, March 25 at 10:00am. Interment will be in Harford Memorial Gardens. To send flowers or a remembrance gift to the family of Carmen Julia Rios, please visit our Tribute Store. "Email Address" would like to share the life celebration of Carmen Julia Rios. Click on the "link" to go to share a favorite memory or leave a condolence message for the family.